54 homes or over $149 million of single family home volume sold in Q4 2017, marking on of the strongest 4th quarters ever! -29 were over $2 million. Median prices were $3.2 million, +9% vs Q4 2016. The biggest price gains were in Windsor Square over Hancock Park, Fremont Place, Larchmont Village and Brookside. The highest sale was at 356 South Hudson for just over $12.4 million. The median price per square foot is $897. 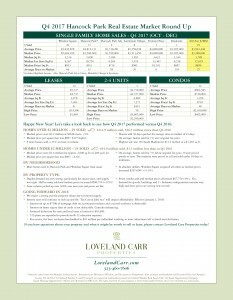 Inventory is low and demand is still strong especially under $4.2 million. Duplexes are in very high demand as well. Strategic pricing is still critical. Buyers are out there but VERY discerning!